Holy cow!! I'm a winner! I just got word that my Woodland Fairy Outfit has been chosen as the winning entry in the Klutz Paper Fashions Fantasy Design Challenge! 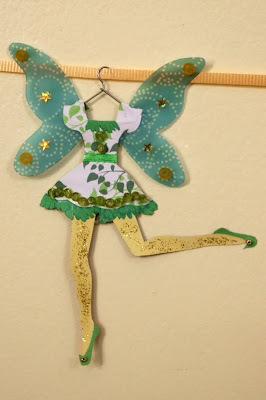 Here's the story: Klutz invited craft bloggers from near and far to submit their very own original fantasy outfit created using their new book, Klutz Paper Fashions Fantasy. I was given a copy of the book to review and invited to enter as well. The book is so much fun for little girls (and now you know, big ones too) because it contains stencils and patterned papers and embellishments and everything you need to create fantasy fashions out of paper. I'm still flabbergasted that I won! I certainly don't think of myself as a craft blogger, just someone who loved doodling and creating so much as a little girl that she still occasionally dabbles in it when she thinks no one else is looking. There were so many amazing designs! Alfie, loyal soul that he is, told me he didn't think any of the other designs was any better than mine. I was told that Klutz chose my design because it used the most materials and elements from the book. But I'm so happy they liked it, I'm going to accept and say thanks before the Klutz people change their minds! So thank you, Klutz, Thank You! !